the book should be fun. If it’s not, choose something else. you don’t need to read cover to cover. Read the back first. Re-read. Savor the flavor. CRACK reading works on several levels. Repeated exposure to a language or a skill takes advantage of both short term and long term memory. It also helps maintain and sustain momentum. And most importantly, life is short why not enjoy it by surfing all the great skills, ideas, and silliness your mind can surf? Now, here is where you can take CRACK to the newest heights: HYBRIDIZE it! This works especially well if you are trying to learn a foreign language. For example, the author of Study Hacks! 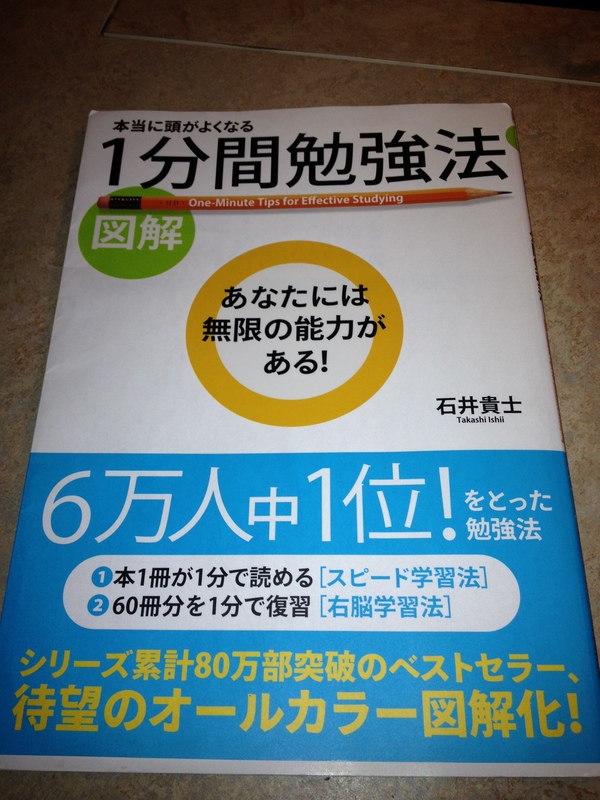 suggests that his Japanese readers learn English by reading the great English books about accounting. If you make the happiness decision then maybe you can experience more creativity in your life. Self-loathing and criticism aren’t going to help you. CRACK will. My Japanese guitar books. Learning through love. Trying to make the happy decisions. Two birds with one CRACK. Let’s say you’ve done something silly like make New Year’s resolutions. You want to learn Japanese and you want to learn Japanese. Get your little hands on a fun little guitar book and carry that around (or copy pages of it). Pull it out and enjoy it whenever you have a minute. Remember, it’s always a good time for CRACK. You understand Japanese/Spanish/German/Serbo-Croatian? You don’t even understand the letters? Look at the pictures. Look at the letters. Admire how cool they are. Move on. Have fun. Remember: if it’s not CRACK, it’s whack! Hybridize, enjoy, have fun, and enjoy the year of the CRACK! I have discovered crack, and it is good. I do crack whenever I have a moment. Well, a crack is actually a moment because the crack that I am using is cracks in time–little moments when I can do a little part of a dream: study a little Japanese, add a couple more sentences to my blog, look at the Circle of Fifths and wonder, what the heck! My trusty vibrating timer. What I like about this timer is that once the timer goes off, it starts counting up and reminds me of how much time has elapsed since I last spent time on focused tasks: writing, cleaning, SRS reps, etc. It’s a gentle way of keeping me honest. Here 21 minutes have elapsed since my last flashcard reps.
Use the time you would normally be “doing nothing” to study. The short “crack time” creates a sort of nervousness that can lead to more effective studying. Koyama says you should take advantage of time commuting to work, waiting time, etc to pull out your smart phone and check out your latest Evernote entries. (I’m still just playing around with this tool to capture notes for guitar scales, notes on Mangajin’s Japanese Through Comics, etc). You could also use Anki, Surusu, or any other SRS system. Or you could just pull out the fun book you are reading in your target language or subject. You can do crack in the elevator, on the train, waiting for the train, while your children are up to mischief (oh how lovely! you’ve unspooled the toilet paper onto the floor–again! ), etc. Koyama points out that short periods of study have a powerful little benefit. 緊張感。A feeling of nervousness. You set a timer for four minutes and try to get started on the paragraph. You get started and the timer begins to run out and you try to finish and get one more idea down on the page. Little chunks of time turn can turn everything you are trying to attempt into a little game. And it works best when it feels like a game. If it starts feeling like work, play a new game or just space out. I know there are going to be a lot of articles and promotions for how to achieve goals for the New Year. But just sit back, relax, and do crack. 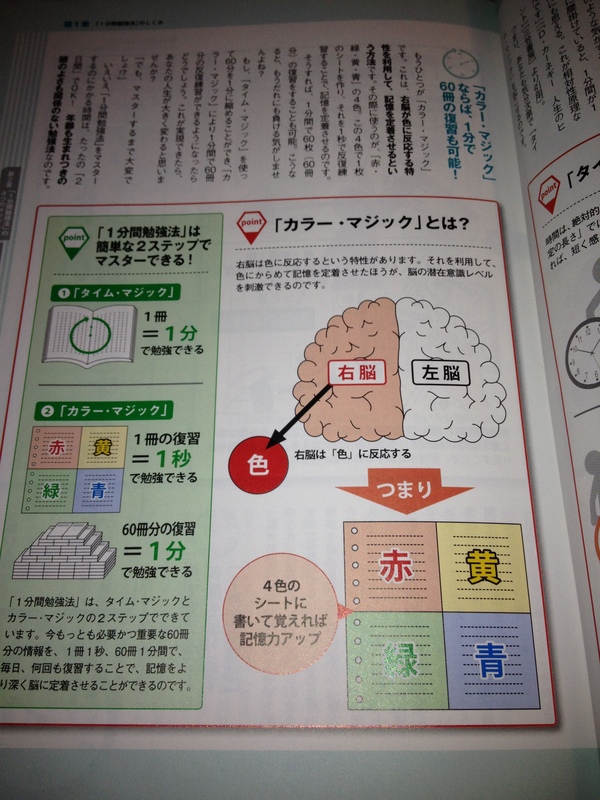 An excellent example of some of the graphics that help you understand the １分　process. After mastering the “one minute” process of reviewing a book, the focus is on “color magic.” Basically, you organize information from the book into colored sheets. You can create one sheet for each book and eventually, review 60 books in one minute. I haven’t totally incorporated this system but I like the idea of page turning. There are so many unread books on my shelves that it is intimidating. However, just flipping through the pages and catching random chapter titles is both a learning experience and helps me develop a road-map for what I want to read. I haven’t methodically used the one-minute review system, but I’ve found that it has really helped to get me reading again. I do a quick “speed date” with some of the books that have been lingering in my apartment. It reminds me of why I picked them up in the first place and gives me a preview of what I want to read for. Then I just read in the normal fashion. 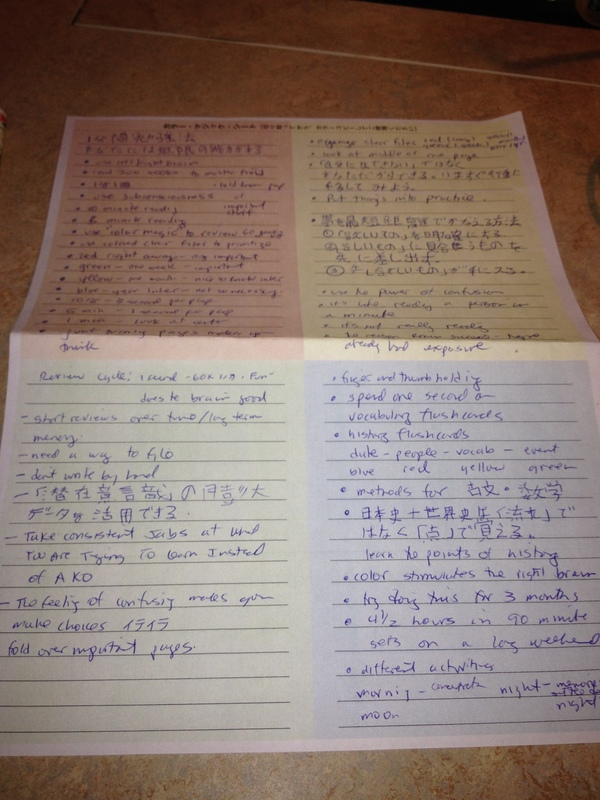 Here are my notes on the multicolored paper. Crucial information is in the red box. The least crucial information is in the blue box. I’m not sure if you make these after just reviewing a book for one minute or whether you do this after a longer reading. This is my sheet for 1分勉強法. Time will tell if I will continue with this method. 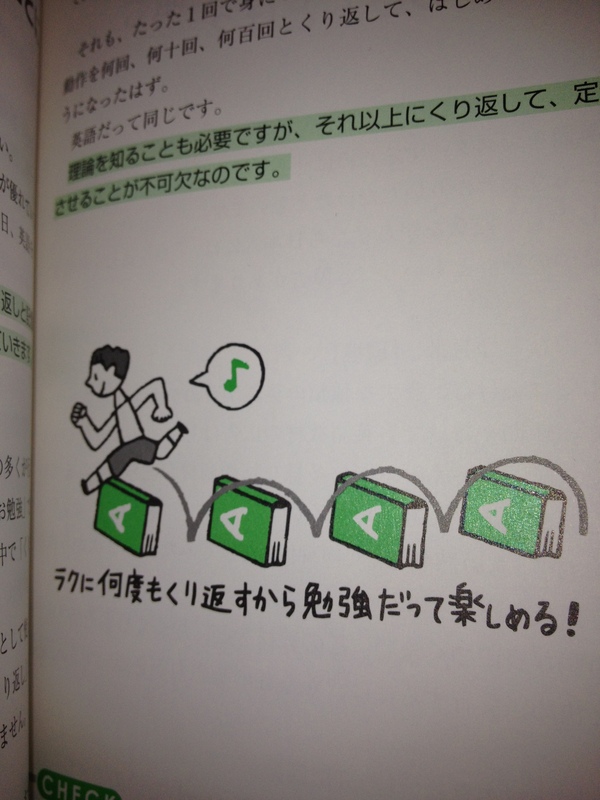 However, with Japanese books, I have given up looking up new vocabulary when I am just reading for fun. I just enjoy meeting a new word for the first time. I know more and more kanji everyday and can figure out the meanings of a lot of words. 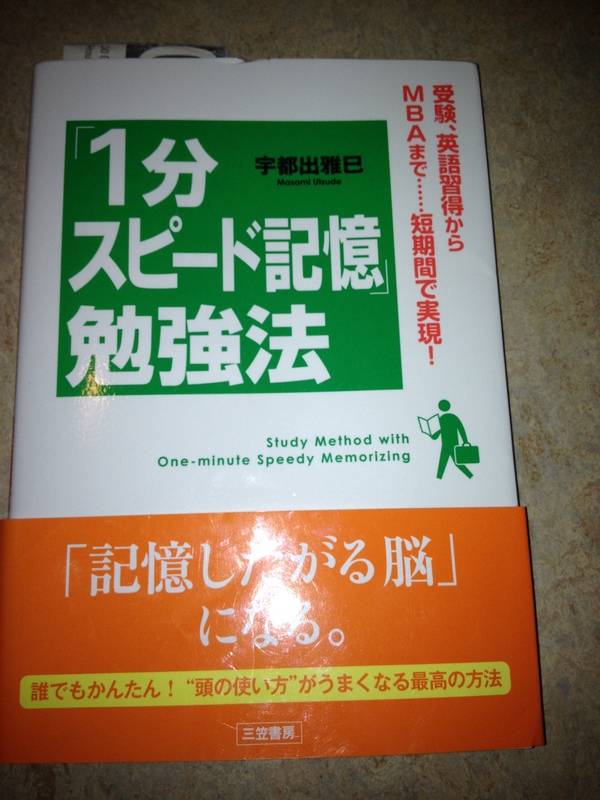 I also know that I have time every day when I study new vocabulary more intentionally. Having a mid-life reading crisis? Don’t give up on reading. Add some speed and a lot of color. It’ the 1分 way! Reading is fun for da mental!